1. CHECK-IN IS AFTER 3 P.M. AND CHECK-OUT IS 10 A.M. Please no early check-ins or late check-outs. *INCLUSIVE FEES – Rates include a one-time linen-towel/toiletry setup. Amenity fees are included in the rental rate. 2. NON SMOKING POLICY: Due to its pristine and natural settings, The Bali House and Cottage has a strictly enforced “Non Smoking Policy”. Guests will be billed for additional cleaning fees for any breach in conduct. *FALSIFIED RESERVATIONS – Any reservation obtained under false pretense will be subject to forfeiture of advance payment, deposit and/or rental money, and the party will not be permitted to check in and if checked in, will be asked to leave immediately. 3. NO PETS POLICY: As much as we know you will miss your pets, there are absolutely NO PETS allowed on the property. 4. RESERVATION DEPOSIT: 90 day notice required. A reservation deposit of 50% of the total amount due for The Bali House and Cottage is required upon booking. A Pay Pal invoice will be sent upon a booking request. All major credit card/debit cards are accepted. An invoice will be emailed when reserving. Payment must be received at the time of booking the reservation. a) No damage is done to house, cottage, patio, lanai, hot tub, beach gear or any of its contents, beyond normal wear and tear upon check out. b) Any charges that are incurred due to contraband, pets or collection of rents or services rendered during the stay will be settled before check out. c) All outstanding balances must be settled 30 days before arrival . d) No linens, beach gear, chairs, towels, robes, snorkel gear, hiking and house/cottage kitchen equipment and or accessories are lost or damaged. e) All trash disposed of in collection bin outside, dishes cleaned, patio areas cleaned as well BBQ grill , and all items in House such as furniture returned to its original location. f) Hot Tub – No children under the age of 17 permitted in hot tub at any time. When using the hot tub, remember there is certain health risk associated with this facility. Use at your own risk. We drain, sanitize, refill and replenish chemicals in the Hot tub prior to your arrival; therefore, it may not be warm till later that evening. Hot tub covers are for insulation purposes and are not designed to support a person or persons. DO NOT STAND ON HOT TUB COVER, they will break and you will be charged for replacement. Remember when not using the hot tub, leave cover on so hot tub will stay warm. g) Please let us know immediately if any equipment is not operating correctly. We will make every reasonable effort to have repairs made as soon as possible; however, there are limited service contractors in our areas, particularly on evenings or weekends. If a breakdown should occur to fundamental elements such as water systems, plumbing and electrical systems, and major appliances such as stove or refrigerator, every effort will be made to repair or replace, or an appropriate refund will be made for the inconvenience caused. No reduction of rent, rebate, or refund will be issued for a mechanical failure of non essential appliances including but not limited to dishwasher, washer, dryer, entertainment systems or hot tub. h) NO SHOE / NO SAND POLICY: All guests are asked to rinse off all sand prior to entering The Bali House and Cottage and to refrain from wearing shoes inside.This will help to keep up the Aloha Spirit and keep the cottage in good condition. 5. CANCELLATIONS: All reservation cancellations will require a written notice 90 day notice. Otherwise, No refunds..
6. MAXIMUM OCCUPANCY- The maximum number of guests in the entire estate is limited to 8 persons (including the Loft & Studio cottages). The maximum number of guests in The Bali House is 4 (No Exceptions) and The Cottage is limited to 2 (No exceptions). Only Guests registered with the property manager will be permitted on the premises. 7. PROPERTY REQUIRES A (3) NIGHT MINIMUM STAY. 9. RATE CHANGES – Rates subject to change without notice. c) Any unused portion of rent from a guest currently registered. e) Any advance rents collected or deposited for a reservation that is scheduled to arrive during the "Tsunami/Hurricane Warning" period. 11. Handling fees (3% Pay Pal) will be added to above rates. Cash or bank only money orders accepted for any rent balances. 13. Left Property: Please check every drawer and cupboard carefully before you depart to ensure you have all your belongings. Don’t forget to look under the beds. If you get home and find you have left something behind, call or email to let us know. We will package the item/items up and let you know the cost of sending them so you can decide if you wish to have them returned. Unless you wish them sent urgently, we will wait until we are scheduled to visit the post office, so you are not charged for our caretaker’s time and mileage to make a special trip. We will either deduct the cost from your damage deposit or ask for a PayPal payment prior to dispatching the package. 14.KEY POLICY: Keys will be obtained on site during check-in, All keys must be returned by check-out in order to avoid a re-keying fee of $250.00 per lost key. 16. 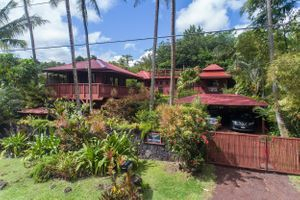 We are a Licensed Vacation Rental in the State of Hawaii. 18 The Bali House and Cottage, employees and owners, are not responsible for any lost, stolen items, injuries and or death while on the premises. We highly recommend you purchase travel insurance. If you wish to purchase travel insurance, go to www.InsureMyTrip.com for details and to purchase.